For a positive integer , is the number of distinct prime factors of . The number of squarefree divisors of is . We define to be the sum of for positive integers . 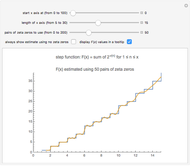 The graph of is an irregular step function. 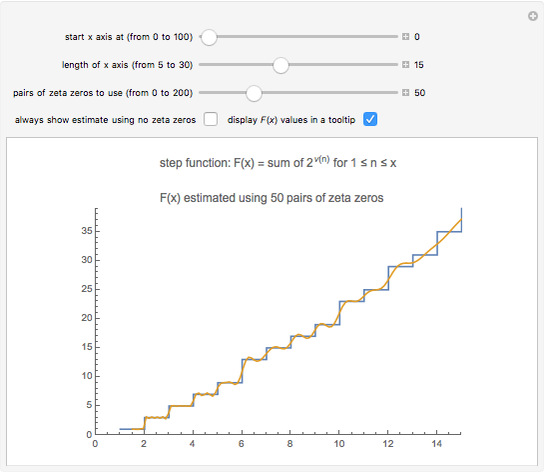 This Demonstration illustrates the remarkable fact that we can closely approximate this step function by using a sum that involves zeros of the Riemann zeta function . We call an integer "squarefree" if it is not divisible by the square of any prime. The first ten squarefree numbers are 1, 2, 3, 5, 6, 7, 10, 11, 13, and 14. The sum of over positive integers is a function of that we denote by . 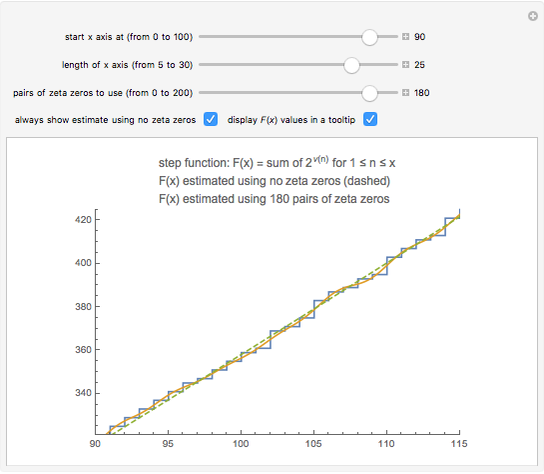 is an increasing, but irregular, step function. The first three complex zeros of the zeta function are approximately , , and . The zeros occur in conjugate pairs, so if is a zero, then so is . The important Riemann hypothesis is the unproven conjecture that all these complex zeros have real part 1/2. So far, it has been verified that the first complex zeros do, indeed, have real part 1/2 (see ). 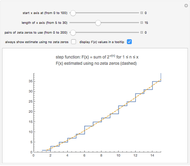 If you use the slider to choose, say, pair of zeta zeros, then the first sum in the above formula, in effect, combines two terms corresponding to the first pair of zeta zeros and . These two terms are conjugates of each other. So, when these terms are added, their imaginary parts cancel while their real parts add. The applied to the first sum is simply an efficient way to combine the two terms for each pair of zeta zeros. Notice that the second sum has the same form as the first, except that the second sum extends over the so-called "trivial" zeros of the zeta function, namely, . The second sum is small when is large. The dominant terms in the formula are . If you use the slider to choose "no zeta zeros", this is the estimate of that is plotted. This expression is fairly close to , but the accuracy of the formula improves as we include terms with zeta zeros. This Demonstration shows that the zeros of the zeta function somehow carry information about the squarefree divisors of the integers. All known zeta zeros have multiplicity 1. The above formula assumes that all zeta zeros have multiplicity 1. At those values of where jumps from to , the above formula converges to the midpoint, , as approaches infinity. Where Does Equation 1 Come From? where . By Cauchy's residue theorem, the value of this integral can be calculated by summing the residues of the integrand. This can be found on page 255 of . 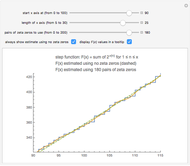 We now apply Perron's formula with and . We shift the integration contour to the left to include the residues listed below. The residues arise from the values of where the numerator of the integrand has a pole, or where the denominator is 0. In formula (1) above, comes from the residue of at . The expression comes from the residue at , where the numerator has a pole. The first sum in equation (1) is the sum of the residues at the nontrivial zeros of . ( is the nontrivial zero of , so is the zero of ). The second sum comes from the trivial zeros of . In analytic number theory, formula (1) is known as an "explicit formula"; there are others in the last six related links. X. Gourdon, "The 10^13 First Zeros of the Riemann Zeta Function, and Zeros Computation at Very Large Height." G. H. Hardy and E. M. Wright, An Introduction to the Theory of Numbers, 4th ed., Oxford: Oxford University Press, 1965. H. L. Montgomery and R. C. Vaughan, Multiplicative Number Theory: I. Classical Theory, Cambridge: Cambridge University Press, 2007. Robert Baillie "Using Zeta Zeros to Tally Squarefree Divisors"